Filing Taxes Online - Protect Your Privacy - HBS Financial Group, Ltd.
(GAL) – If you’re planning on filing taxes online, and you have concerns over privacy issues, we have some tips for you that will help. All of us have read some horror stories that detail how hackers have gained access to some firm’s computer database and recovered highly confidential information that was later sold. If you happen to be one of many Americans who have decided to file taxes online, and still have some concern over privacy and security, there are a number of things that you can do to protect yourself and your confidential information. More and more firms, including the Internal Revenue Service, have pretty much standardized digital delivery of documents and other information. Many of us still have security issues regarding use of our financial information on the world wide web. There was a poll taken by one of the online tax filing websites where the results indicated that 49% of the American population had some degree, or substantial concerns using a desktop computer for filing taxes online. Their concerns were well founded. However, instead of fretting over these issues, we need instead to take action to make it as secure as possible. We offer these five (5) tips for your consideration that you can do to be certain that your confidential personal, as well as financial information, is protected online. Never, ever, think of filing taxes online while you are in a WI-Fi location and especially using the WI-Fi connection on those premises. If you are using you own wireless Internet setup, be absolutely sure that it has a network key for protection. Make certain that your computer is secure using a good firewall and current anti-virus and anti-malware software. Again, if you are using a laptop, smart phone or a tablet device, use a strong password to protect your confidential information should they be lost or stolen. We don’t recommend using any of those devices for storing this type of confidential information. If you must use these types of devices, remote phone locks should be setup for the smart phone and also the GPS software that tracks the I Phone. This may stop thieves to some extent. Strong security software must be downloaded for your smart phone and also your laptop computer. As mentioned above, a good anti-virus software program is a must as is malware blocking software when filing taxes online. If you are working from home, a hardware firewall can be installed as an additional level of protection when filing taxes online. Should you still harbor concerns and feel that your online privacy has been compromised by one of the online tax filing sites, you should contact the Federal Trade Commission to file a complaint if your rights have been violated in some way. The Internal Revenue Service has instituted six standards concerning security, privacy, and business that every online tax preparation vendor must comply with in order to protect every taxpayer’s privacy. In addition, there are fairly strong regulations that were put in place by the Gramm, Leach, Bliley Act. These regulations require that every financial firm, including accountants and tax preparers, that offer any type of service to a consumer, tell them how and if the information provided is shared and how that information is protected. The tips above, if followed, will give you a good measure of security and privacy for filing taxes online, but remember, don’t use any of the public facilities if you are going the wireless route. 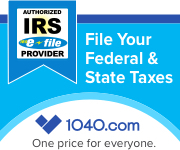 This link will take you to our highly secure online tax filing site at 1040.com. You can try it Free.